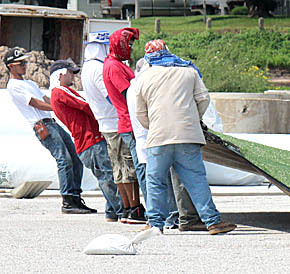 Workers were installing the new field turf on the Boone Central football field last week, and had covered nearly all of the main field by Friday, Aug. 23. Sidelines and the north endzone remained to be finished this week. Components for the new bleachers are expected to arrive next week. Details in the Aug. 28 Albion News Print & E-Editions.